﻿ Audissie Pension Hotel, Palawan - SAVE ON AGODA! "Stay here for the basics namely clean bathroom, working air..."
Have a question for Audissie Pension Hotel? "Staff were very friendly and accomodating." "The location is near the airport and bay walk where you can relax and choose seafoods and have them cook it the way you want them cooked." 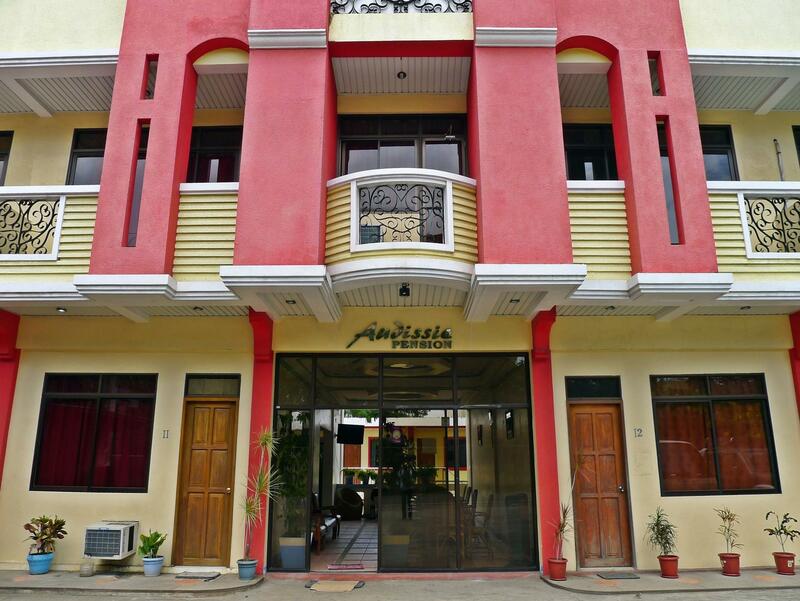 "Big room , friendly staff ,"
This hotel is located in the heart of Puerto Princesa City. Palawan Museum and City Bay Walk are in the list of local attractions. Guests also have easy access to Puerto Princesa Underground River, Tubbataha Reef, and Immaculate Conception Cathedral. This hotel features well-appointed guestrooms which are spacious and tastefully designed. Each air conditioned guestroom is equipped with cable TV and a private bathroom with a hot and cold shower. Ideal for business and leisure, Audissie Pension Hotel features all the appealing accommodation facilities that all types of guests look for. No wifi, then the owner insist us to pay 800 but i told them that i saw online the booking is only 750 pesos. When we told the staff they say they need to wait for owner to clarify. I had a bad experience checking in this hotel. I booked through Agoda in the morning of my check in day. When I arrived at the hotel around 3PM after a tiring city tour, the hotel staff asked where I booked from and I replied it is through Agoda. They then asked if I had a confirmation letter from Agoda and I showed the confirmation email through my cellphone. They did not honor that! I said the email came straight from Agoda. At this age, digital documents should be honored. They even said that there was no booking from Agoda. How come? I believe Agoda won't book me and didn't complete the payment process if they have not notified the hotel that a room should be made available. After a long verbal tussel with the owner, I was able to get my room because I deserved it and it was my right. What a businessman! What a bad service hotel! We booked this on Agoda the same day we were checking in. Agoda cleared the booking and the payment. When we arrived, the owner and receptionist were talking and I informed them that I had an Agoda booking for today, 2 nights. The owner was not accommodating at all, and said that their rooms were all full, and that they blocked their Agoda already. I asked then why were several rooms there available on the Agoda page, and that I had fully paid already via credit card. He said that it's not his problem, and that's an issue I have to deal with Agoda directly. What? It's their responsibility to keep tabs on Agoda, not mine. I just kept quiet because I was tired, and showed him the booking confirmation code. He then instructed his receptionist to take us up to Room 4, which was completely clean and ready for occupancy. Is this what they mean by "fully booked"? Selective accommodation? Just because we booked through Agoda at discount? The room was okay, clean, but the beds are awfully hard for a pension "hotel" at this price range. And needless to say, I cannot recommend this place because of the way we were treated. Would not stay here again. The staff were friendly and accommodating. The location was very good. It was near the city and I was able to go around. The room was nice and cozy and clean. I went to El Nido and they were nice enough to let me leave my bags there. so that I didn't have to bring everything then go back again. the place is clean. staff were very friendly and accomodating. the location is near the airport and bay walk where you can relax and choose seafoods and have them cook it the way you want them cooked. I spent 2 nights here and upon arrival was asked for a 900 peso deposit. I booked a tour with the hotel and a bus to el nido. When the bus arrived on 3rd day I tried to check out and recover my deposit. After I was questioned 5 times about my payment on Agoda, for which I showed proof on my phone, and after the staff had spent 20 minutes 'upstairs on the computer' the manager was called. He then proceeded to tell me I had to print off a copy of my booking to to get my deposit back. After 4 months of travelling using Agoda, this was a first. I asked him how I was supposed to print the receipt and he said it wasn't his problem. I told him that was stealing and he proceeded to verbally abuse me. I'm still in the process of trying to resolve the issue, but I would advise anyone against staying here. Unfortunately this is the first bad review Ive had to write on my trip. Stay here just for one night before going to El Nido. The only reason we choose this hotel is because it's close to the Baywalk so we can spend time there in the evening. Room is old, facilities are poor and there is no hot water. Wifi is very weak and can not be accessed in the room. Stay here for the basics namely clean bathroom, working air conditioner, beds with clean sheets and fresh towels plus soap. They give nothing else. No breakfast. Basic wifi. Worth it given their prices. Garish exteriors and lousy location down a busy market street, are only negatives. We stayed just one night, ants were in your room, bathroom was dirty and fossilised, so we looked immediately for a new hotel! First day, greeted with (Hotel Owner ) arguements. I presented the Hotel with Booking ID, the Owner was asking me the print of my booking, keeps on repeating. They should have a printer, why hassles their guest. Wifi is accessible only on the ground floor and too slow. The staffs were nice. Okay place to stay. Good location, not next to noisy main road. Staff was really nice. big room, have balcony, with cable t.v. its not that good. When we arrived in the hotel the owner is not that accomodating and the room that we reserved is not yet ready, she ask her staff to accompany us in one room but when we get there they told us that there is a problem in the aircon so we have to moved in another room, and then we choose the other room but when we check the comfort room there is no hot shower only cold so we have take a shower even if its so cold in the morning or even in the evening. the staff is not that accurate for the info. It was good for a backpacker and for someone who wouldn't look for some comfort aside from a place to sleep and rest after a tiring day tour. As it was centrally located, we had no trouble going out and eating at the restaurants outside even at night. It was also walking distance to the Baywalk so you could enjoy the view there at night. Many tricycles are outside the place and won't ask you to pay higher rate (9php)unlike if you would stay in hotel far from local town. The inn was quiet and the staff were friendly and accommodating. Our stay was satisfactory. we did our booking for the Underground River , Ugong Rock Cave and Zipline, and Irawan Eco Park Adventure and Zipline thru the hotel. Tour arrangements was good and on time. Hotel was OK with quiet sorroundings. Room has a comfortable bed, ensuite bathroom was OK but our room has no hot water, air-conditioning was good and room has large window overlooking the bay. Free shuttle service airport to hotel and vice versa. Wi-Fi even inside our room has a good signal. I love wifi zones,but the connection there was too slow and I wasn't able to connect at all which pissed me often,very poor service- they don't even ask there guest if they need something and offer something that will please them and lastly,although they informed us about the on going construction near our room, the place is not good for us to stay,no good view and no good ambiance. If I'm to give a star I will give them 1 star or half star will do.